High quality neckwear is not difficult to come by in London. There are certainly masses of lower standard ties – which are still not half as bad as many make out – but there are an equally large number of very fine neckties available from a variety of high-end stores that cater for the high-spending gentleman about town. However, while quality is not an issue, variety and tastefulness of design certainly is. I can’t remember the number of times I have looked through an elite department store’s vast display of ties, or the abundance at a Jermyn Street boutique only to conclude that the little-used vintage items on eBay that I had my eye on were of superior design. Perhaps it says more about my taste for a bygone aesthetic and dislike of the mode of today, but I cannot fathom spending £75 on a brand new necktie unless I am absolutely in love with it. Love is an important thing where ties are concerned. There is no rational ‘need’ associated with neckwear. After all, they don’t keep you warm and you will not be arrested if you fail to wear one. When they were worn everyday by everyone, I can imagine they would have been treated in much the same way that underwear and hosiery are today; by careless, and loveless, acquisition. Ties have become a very optional accessory and therefore an accessory that needs to be of sufficient attraction to merit deployment. Though I am rarely seen without one, I am actually very picky. I was therefore delighted when, after being introduced to a new gentlemen’s accessories company, I discovered that their stock of neckties was both unusual and tasteful. 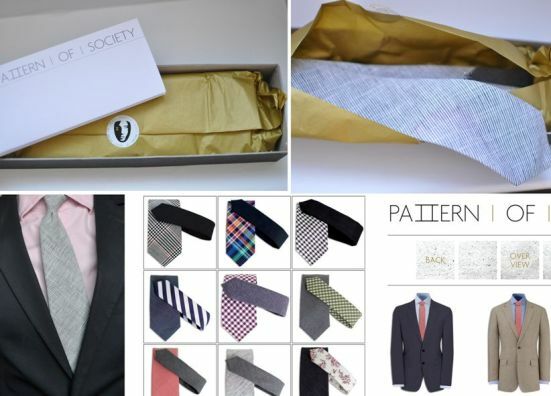 Founded in 2010 by Gisa Klement, Pattern of Society (PoS) focuses on designing, making and selling fine neckties. Unusually, these ties are mostly of fine cotton or virgin wool. PoS has avoided silk, the bling-bling of neckwear, and opted for subtlety and restraint. With this choice, I agree wholeheartedly. The last six or seven ties I have bought have either been of a matte silk, cotton or wool. Satin silk has been like kryptonite for me; it’s too shiny, too I’m-a-generic-politician, too commonplace and intolerably vulgar. My reaction has been to swing to the other side; virgin wool, cashmere and cotton for summer. PoS have 19 styles of necktie to choose from, each piece handcrafted and assembled with dual inlay padding made from virgin wool and horsehair. PoS are very proud of the use of horsehair, claiming that its unique qualities ensure stability and recovery after wearing, folding and rolling. However, the hair of the horse is not the only quirk the ties possess. PoS also boast a ‘contrast design.’ Cut of two different materials, the end of the tie contrasts with the front. For some this will be an attractive idiosyncrasy; for others, a crass deviation. I myself am undecided, but should you consider it unappealing, it is not an issue that detracts from the product completely as the end can always be fully hidden behind the front. One of the most charming aspects about the brand is the dedicated page for each tie on the website (It seems website is currently under construction), featuring not only high-resolution photos of the product itself but also three suggestions for combinations featuring the tie. This is a small touch but one that provides important inspiration which can help customers feel more confident of their purchase. I am always amazed at how little is done to offer such guidance, particularly in the field of accessories. A great number of men are crying out for such assistance and it is a real shame that it is not more forthcoming. Bravo to PoS for making the effort.